CANPEX™ OXY Barrier tubing is ideally suited for HRH applications. 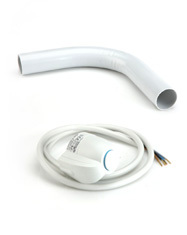 Its light weight and flexibility makes installation of hydronic heat exchange loops fast and easy. CANPERT™ Oxygen Barrier PE-RT Pipe is the latest entrant of advanced PE Raised Temperature resin in the hydronic product line.